Saint Andrew was one of the fishermen of Bethsaida, and was the brother of Saint Peter. He became a disciple of Saint John the Baptist. When called himself by Christ on the banks of the Jordan, his first thought was to go in search of his brother, and he said to Peter, We have found the Messiah! and brought him to Jesus. It was Saint Andrew who, when Christ wished to feed the five thousand in the desert, pointed out a little lad with five loaves and a few fishes. After Pentecost, Saint Andrew went forth upon his mission to plant the Faith in Scythia and Greece and, at the end of years of toil, to win a martyr's crown at Patrae in Achaia. When Saint Andrew first caught sight of the gibbet on which he was to die, he greeted the precious wood with joy. O good cross! he cried, made beautiful by the limbs of Christ, so long desired, now so happily found! Receive me into thy arms and present me to my Master, that He who redeemed me through thee may now accept me from thee! After suffering a cruel scourging he was left, bound by cords, to die upon this diagonal cross. For two whole days the martyr remained hanging on it, alive, preaching with outstretched arms from this chair of truth, to all who came near, and entreating them not to hinder his passion. 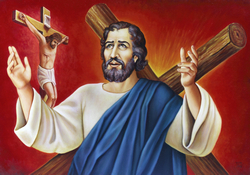 Reflection: If we would do good to others, we must, like Saint Andrew, receive our cross with loving gratitude and not desire to be separated from it, until God so wills. To take up our cross is Jesus' command; are we perhaps dragging ours? Just as the body without the spirit is dead, so also faith without works is dead.